Photographers should take notice of the Terms & Conditions regarding the recently offered Photoshop Creative Cloud and Lightroom 5 bundle they are currently offering to those who own Photoshop C3 or later. 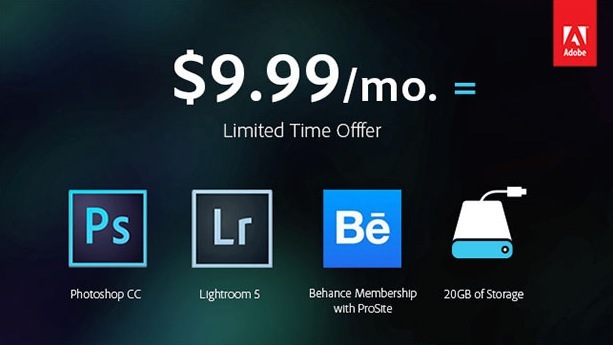 The current offer lets you sign up to a monthly subscription for $9.99 per month if you register before December 31, 2013 and includes Photoshop CC and Lightroom 5. Adobe has promised that the $9.99 is “not an introductory price. It is the price for those of you who sign up by December 31, 2013”. Many photogs are excited about this $9.99 per month BUT we need to read the Terms & Conditions because there seems to be some confusion. Phase One, the company that makes the excellent Capture One Software (a Lightroom replacement) has just updated the software to version 7.1.4. As to the release notes, support for new cameras and lens profiles was added, as well as stability and performance improvements. Is Adobe still trying to screw us Photographers?? So here we are – Adobe has officially made their Photoshop Photography Program available for purchase online. If you already own Photoshop CS3 or higher you are eligible for a Creative Cloud membership for just $9.99/month that includes Photoshop CC, Lightroom 5, 20GB of online storage, access to creative cloud training resources, and ongoing upgrades and discounts. But wait till you read the fine print! I guess I have to give credit where credit is due. Adobe yesterday announced a new subscription plan for photographers interested in only using Photoshop and Lightroom. Called the Adobe Photoshop Photography Program, it certainly is an improvement over their initial subscription plans. With the uproar Adobe created in the photo community since their announcement in May this is the first stab Adobe has had at repairing the damage they created with photographers. Does Adobe’s new Photographer Subscription Plan now work for you? Sound off in the comments below. If you own a previous version of Photoshop CS3 or newer and start your subscription before the end of the year you can qualify for their $9.99 (plus tax) per month subscription offer for photographers. This “introductory offer” includes Photoshop CC, Lightroom 5, Behance Membership, and 20GB of cloud storage. But you must sign up for it before December 31st. You will have to wait a couple weeks to sign up on this offer. Once Lightroom 5.2 is announced in a couple weeks you can then take advantage of this. But while this is certainly an improvement I wouldn’t go so far as to say “Photographers Rejoice” as PetaPixel did. There are still some issues with the subscription model and as such I am still not confident in recommending it to photographers who do not make their full living off of photography.